At first there is nothing special about the picture. But close investigation reveals the past events that had taken place in this spot. It is a beach on the Pacific coast where a couple of turtles species come to lay their eggs. 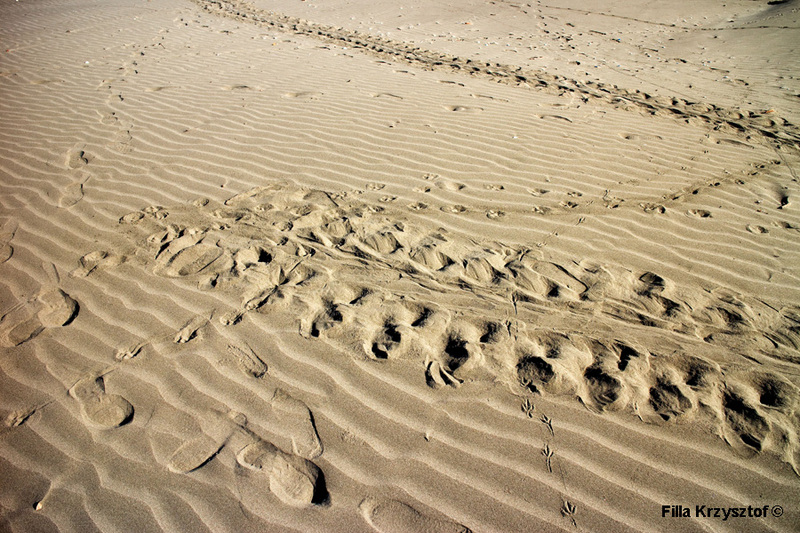 The track behind shows a crawling turtle out of the sea which is on the left side. It drags itself for about 70 m. until it encounters vegetation. Then the turtle makes a loop and crawls back to the see as is seen on the foreground track. The tragedy happens when footprints of a human meet with the turtle and this is the moment when the animal disappears most likely finishing in somebody's pot.